Fisher's most powerful boat towed metal detector for ferrous and non-ferrous metals. The Pulse 12 is in use by military, law enforcement, commercial, and salvage divers world wide. High sensitivity and a very large detection area make this detector an excellent choice for both commercial operations and professional treasure hunters. Commercial Grade Construction, ability to tow up to three coils for extra large detection area, optional computer interface and software, faster towing speeds than the Pulse 10 system, and audio jack for headphones. 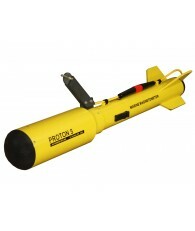 With its 24 foot wide and 16 foot deep detection envelope this detector will locate a variety of targets including aluminum boats, brass propellers, outboard motors, steel anchors, bronze cannons, and gold bars. One of the key features of this detector is the control unit which can accept inputs from 3 search coils. Using three coils instead of one lets the search team cover three times the area with the same amount of time, fuel, and manpower. The claim-to-fame of this pulse induction metal detector is its ability to ignore minerals in the environment while maintaining high sensitivity to all metal targets. 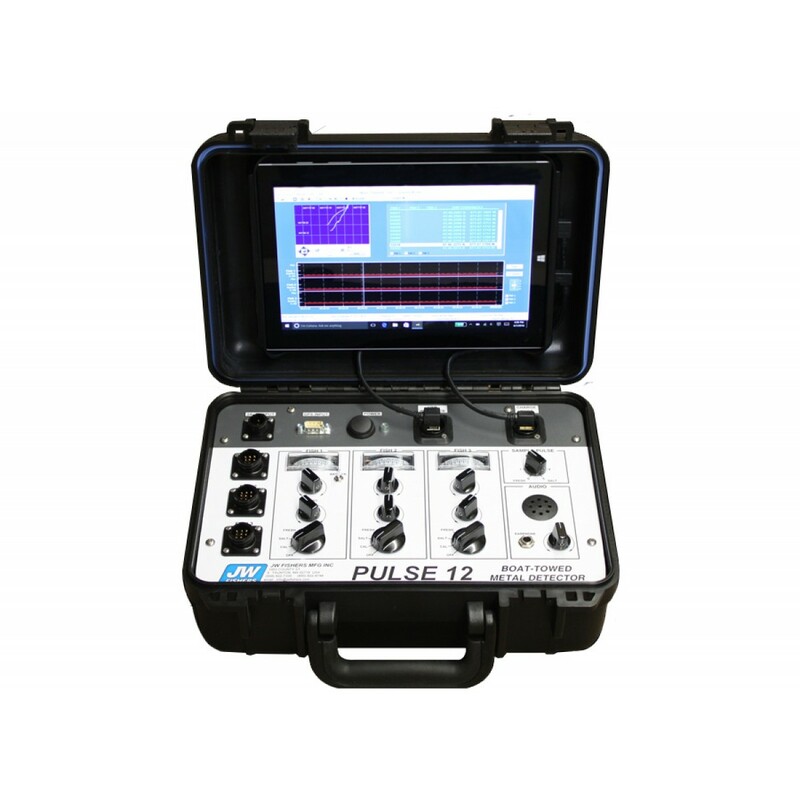 The Pulse 12 is not affected by highly mineralized salt water, coral, high iron content rocks, or magnetic (black) sand, all of which cause erratic readings in conventional detectors. Also, the detection range is unaffected by the medium between the metal detector and the metal target. Performance does not change whether detecting through air, water, silt, sand, or solid coral. 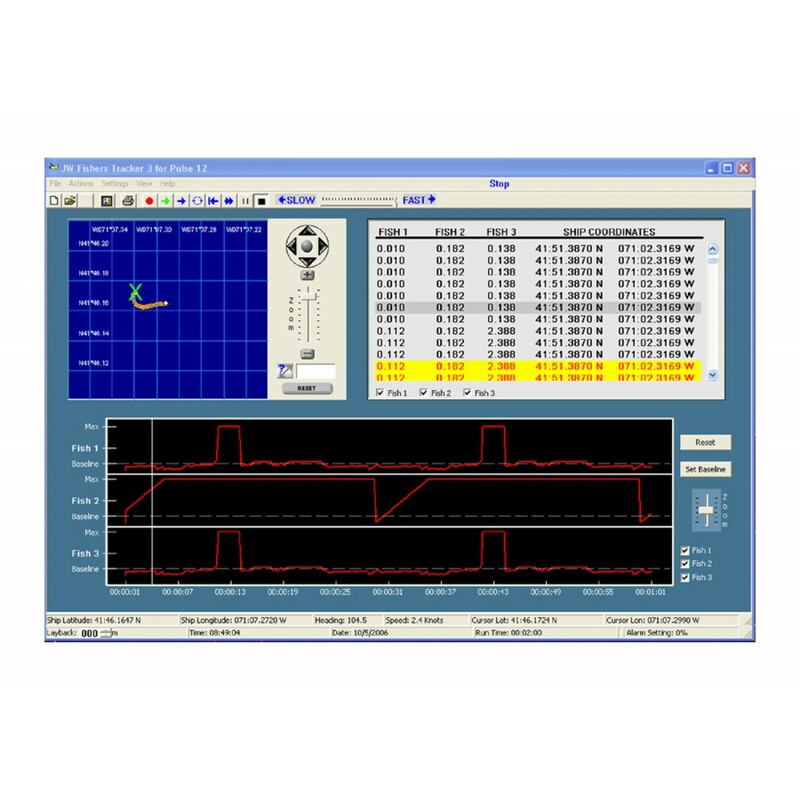 See technical data sheet for actual detection distances. 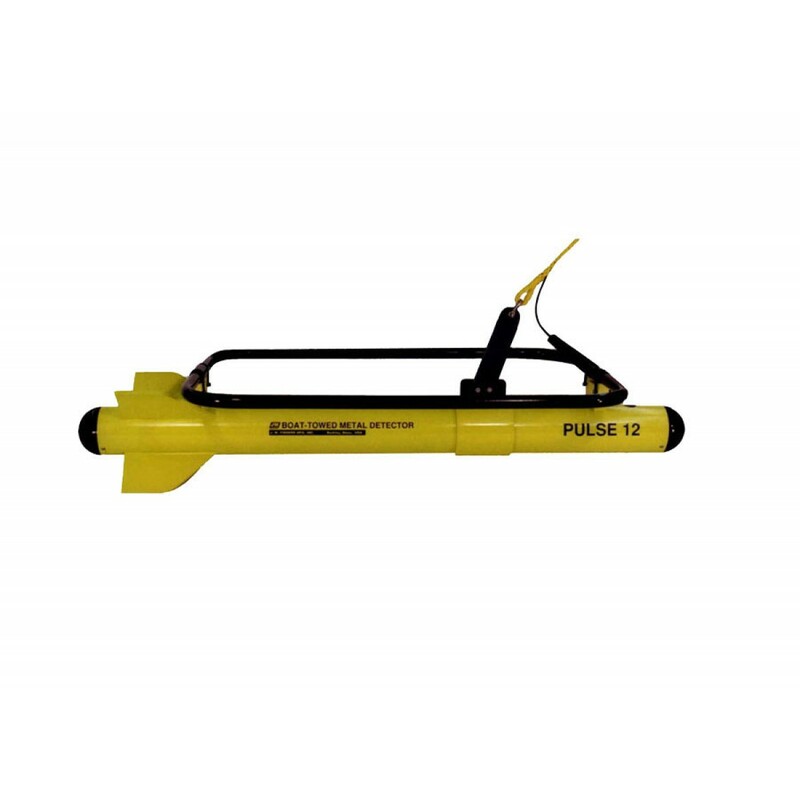 The Pulse 12 system includes a 24 by 36 inch search coil with 150 feet of cable, tow fish, and a top-side control unit. The control unit features three sets of operator controls which allow up to three coils to be towed simultaneously. Both meter and audio readouts indicate target detection from each individual coil. The system is powered by two 12 volt batteries with a total power consumption of only 12 watts. When a target is detected, the readouts and coordinates change color so the operator can quickly see when and where a target is detected. At the bottom left of the screen is a graphical representation of the last 1 minute to 1 hour of Pulse 12 readouts. When a target is detected the line swings up on the graph. In addition to the Pulse 12 and GPS data, other information displayed are the boat's speed, compass heading, and alarm setting. Up to three fish can be displayed on the screen. 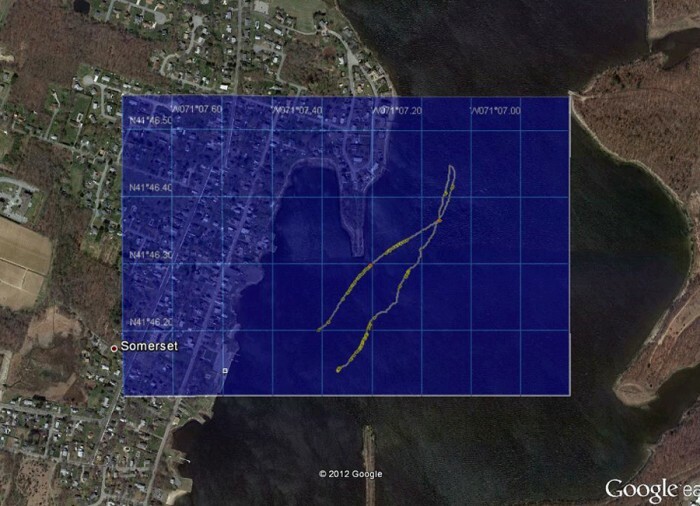 The Tracker map can be exported as an image with a KML file to allow it to be easily overlaid on other mapping programs. All data can be stored on the PC hard-drive or disk. The Pulse 12 is backed by JW Fishers exclusive, UNCONDITIONAL TWO YEAR WARRANTY. Fishers top of the line boat towed pulse induction metal detector detects both ferrous (iron/steel) and nonferrous (gold/silver/aluminum/ bronze/etc.) metals. 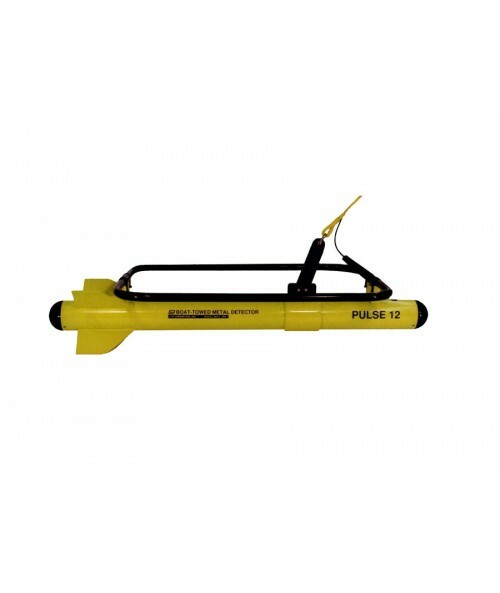 The PULSE 12 is the most powerful towed underwater “all metals” detector on the market today. 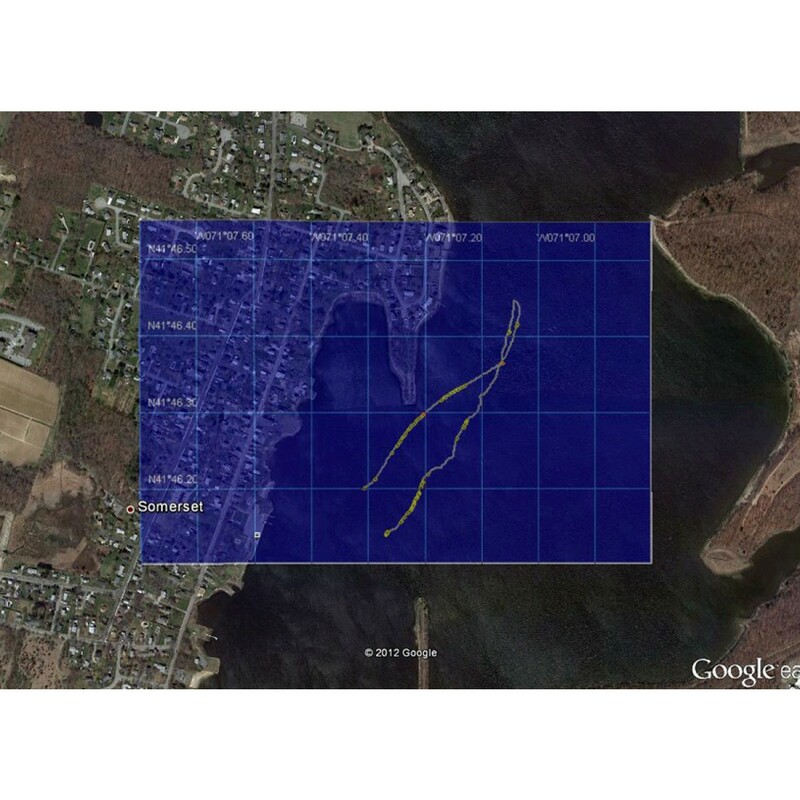 The system has a very large detection envelope with good detection capabilities in salt water and even greater range in fresh water or on land. 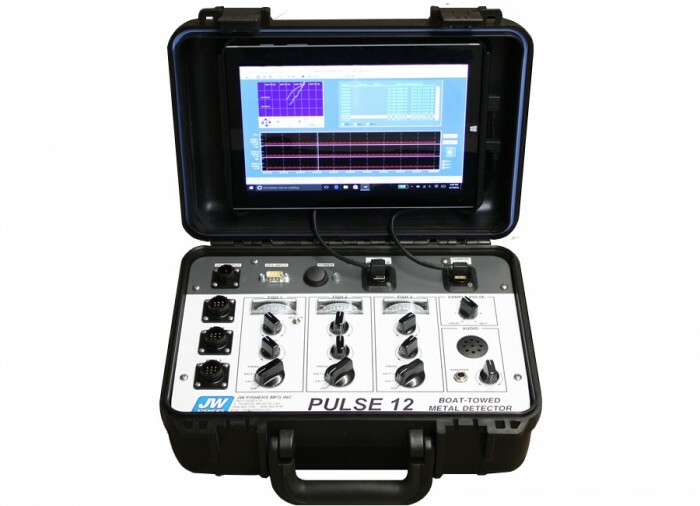 The Pulse 12 comes with a Control Box, a Search Coil with 150 feet of cable, and a Fish. The Search Coil mounts on the Fish and is towed through the water at 1-4 mph. The Control Box has inputs for three Search Coils. Two additional Search Coils can be added at any time and come complete with cable and fish. The additional Coils allow larger areas to be covered. One Fish is towed directly behind the center of the boat and the other Fish are towed to each side of the boat. One, two, or three Fish can be operating at the same time. When using multiple Fish, each has its own controls and meter on the Control Box. 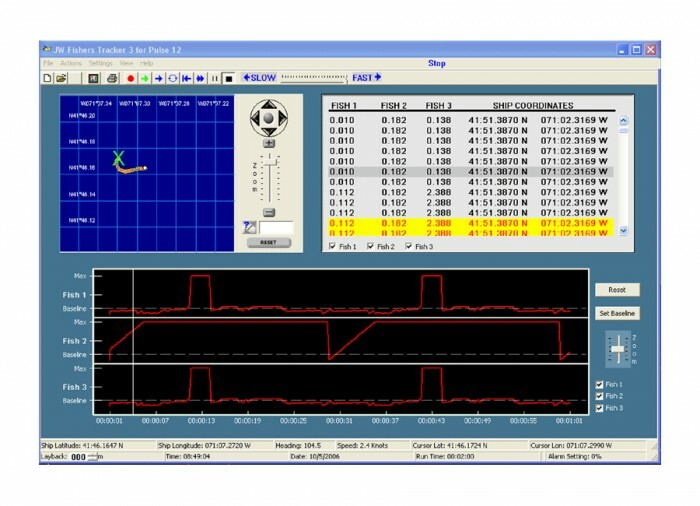 An alarm sounds and the meter swings up when any of the Search Coils detect a target. The complete system is powered by two 12 volt batteries. An Altimeter can be attached to the Fish to inform the operator of the distance between the Fish and the bottom.